Retrospect for Mac and Retrospect for Windows support the majority of email services. SMTP with no authentication or encryption requirements should work without issue. It communicates over port 25. For those that require authentication and/or encryption, Retrospect compatibility depends on the service. They vary in terms of their protocol implementation for TLS and SSL, so you will need to include a platform-specific port after the SMTP server name, separated by a colon: "smtp.example.com:port". Please contact Support to troubleshoot if you are having difficult configuring your email provider. 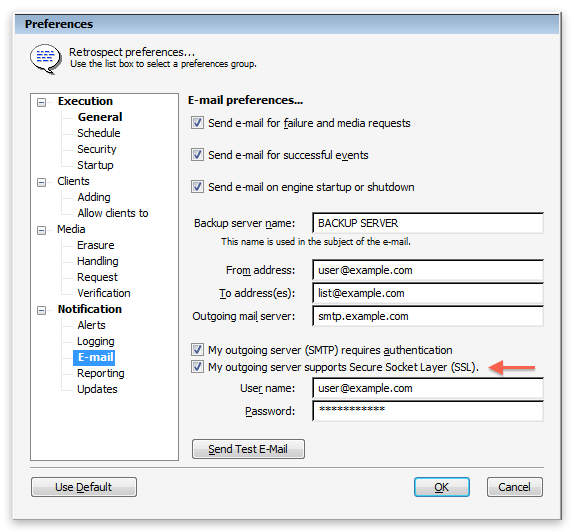 New to Retrospect 10 for Windows and Retrospect 12 for Mac, there is a checkbox to enable SSL for an email account: "My outgoing server supports Secure Socket Layer (SSL)." For new and existing accounts, the checkbox is on by default. 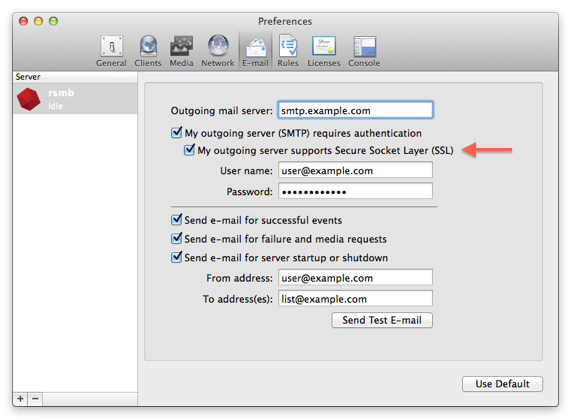 The majority of email services require SSL for communication, but if you encounter email issues, uncheck the box to switch to non-SSL SMTP communication. Application-specific Passwords: These are passwords for a particular third-party application. Services require that you set up two-factor authentication (two-step verification) to allow application-specific passwords. OAuth authentication: This process displays a webpage from the service for users to log in to, so that the underlying application never sees the username and password. Recommended: Enable two-factor authentication (two-step verification) and then set up an application-specific password for Retrospect. Google presents the password with spaces, but be sure not to include any spaces when typing it into Retrospect. Log into your Google Account and adjust the Security Settings. If you encounter the error "Insufficient permissions (-1017)" when testing email notifications, this authentication step is the issue. You’ll see that error if you have not adjusted the security on your Google Account or you have not used the application-specific password with two-factor authentication. Note that for G Suite customers, you will need to ensure in "Security > Advanced security settings > Less secure apps", you have selected "Allow users to manage their access to less secure apps". This option allows application-specific passwords (Google FAQ), and the user’s option can remain disabled. 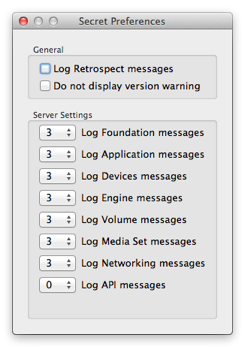 Retrospect 15: Use debug logging and change "Foundation" from 3 to 6. 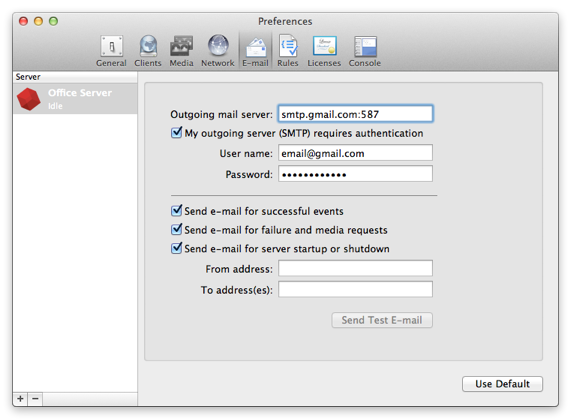 Step 2 - Send a test email from Preferences. The resulting log entries should shed light on the issue. The log is available in the application at Reports > Operations Log on Windows and at View > Log on Mac. You can use a Google search or consult your mail server documentation for help troubleshooting the reported error. Contact our support team for more assistance. If you use a scheduled script instead, you will receive the same three emails, but the final one only comes at the end of the backup script’s execution. If you would prefer to only receive a subset of these, please add a filter or rule to your email service to automatically archive or delete based on the subject. 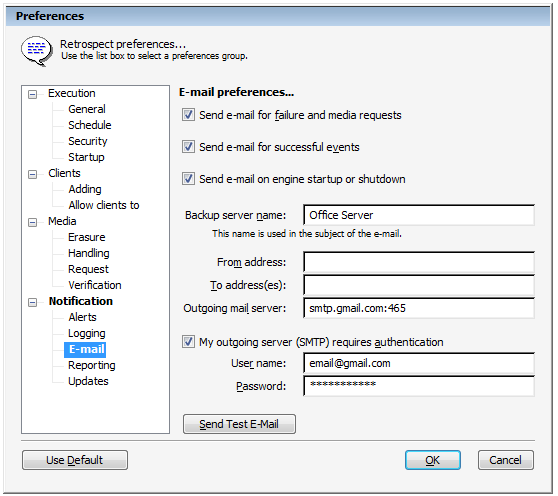 Alternatively, you can disable "Send e-mail for failure and media requests" in "Email" preferences.